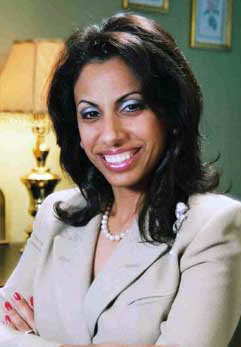 [Editor's Note: Below are selected excerpts from Brigitte Gabriel's speech delivered at the Intelligence Summit in Washington DC, Saturday February 18, 2006]. "We gather here today to share information and knowledge. Intelligence is not merely cold hard data about numerical strength or armament or disposition of military forces. The most important element of intelligence has to be understanding the mindset and intention of the enemy. The West has been wallowing in a state of ignorance and denial for thirty years as Muslim extremist perpetrated evil against innocent victims in the name of Allah. I was ten years old when my home exploded around me, burying me under the rubble and leaving me to drink my blood to survive, as the perpetrators shouted "Allah Akbar!" My only crime was that I was a Christian living in a Christian town. At 10 years old, I learned the meaning of the word "infidel." Tolerating evil is a crime. Appeasing murderers doesn't buy protection. It earns one disrespect and loathing in the enemy's eyes. Yet apathy is the weapon by which the West is committing suicide. Political correctness forms the shackles around our ankles, by which Islamists are leading us to our demise. America and the West are doomed to failure in this war unless they stand up and identify the real enemy: Islam. You hear about Wahabbi and Salafi Islam as the only extreme form of Islam. All the other Muslims, supposedly, are wonderful moderates. Closer to the truth are the pictures of the irrational eruption of violence in reaction to the cartoons of Mohammed printed by a Danish newspaper. From burning embassies, to calls to butcher those who mock Islam, to warnings that the West be prepared for another holocaust, those pictures have given us a glimpse into the real face of the enemy. News pictures and video of these events represent a canvas of hate decorated by different nationalities who share one common ideology of hate, bigotry and intolerance derived from one source: authentic Islam. An Islam that is awakening from centuries of slumber to re-ignite its wrath against the infidel and dominate the world. An Islam which has declared "Intifada" on the West. America and the West can no longer afford to lay in their lazy state of overweight ignorance. The consequences of this mental disease are starting to attack the body, and if they don't take the necessary steps now to control it, death will be knocking soon. If you want to understand the nature of the enemy we face, visualize a tapestry of snakes. They slither and they hiss, and they would eat each other alive, but they will unite in a hideous mass to achieve their common goal of imposing Islam on the world. This is the ugly face of the enemy we are fighting. We are fighting a powerful ideology that is capable of altering basic human instincts. An ideology that can turn a mother into a launching pad of death. A perfect example is a recently elected Hamas official in the Palestinian Territorieswho raves in heavenly joy about sending her three sons to death and offering the ones who are still alive for the cause. It is an ideology that is capable of offering highly educated individuals such as doctors and lawyers far more joy in attaining death than any respect and stature, life in society is ever capable of giving them. The United States has been a prime target for radical Islamic hatred and terror. Every Friday, mosques in the Middle East ring with shrill prayers and monotonous chants calling death, destruction and damnation down on America and its people. The radical Islamists' deeds have been as vile as their words. Since the Iran hostage crisis, more than three thousand Americans have died in a terror campaign almost unprecedented in its calculated cruelty along with thousands of other citizens worldwide. Even the Nazis did not turn their own children into human bombs, and then rejoice at their deaths as well the deaths of their victims. This intentional, indiscriminate and wholesale murder of innocent American citizens is justified and glorified in the name of Islam. America cannot effectively defend itself in this war unless and until the American people understand the nature of the enemy that we face. Even after 9/11 there are those who say that we must "engage" our terrorist enemies, that we must "address their grievances". Their grievance is our freedom of religion. Their grievance is our freedom of speech. Their grievance is our democratic process where the rule of law comes from the voices of many not that of just one prophet. It is the respect we instill in our children towards all religions. It is the equality we grant each other as human beings sharing a planet and striving to make the world a better place for all humanity. Their grievance is the kindness and respect a man shows a woman, the justice we practice as equals under the law, and the mercy we grant our enemy. Their grievance cannot be answered by an apology for who or what we are. Our mediocre attitude of not confronting Islamic forces of bigotry and hatred wherever they raised their ugly head in the last 30 years, has empowered and strengthened our enemy to launch a full scale attack on the very freedoms we cherish in their effort to impose their values and way of life on our civilization. If we don't wake up and challenge our Muslim community to take action against the terrorists within it, if we don't believe in ourselves as Americans and in the standards we should hold every patriotic American to, we are going to pay a price for our delusion. For the sake of our children and our country, we must wake up and take action. In the face of a torrent of hateful invective and terrorist murder, America's learning curve since the Iran hostage crisis is so shallow that it is almost flat. The longer we lay supine, the more difficult it will be to stand erect."